While I was filming with Food Network in Morocco I was introduced to a delightful Berber family in a little village called Ait Ouzzine. They lived in complete rhythm with the seasons, eating only what had been harvested or reared on their own land or what could be caught or foraged. It was as if time had stood still: they collected wood in the mountains every day when they took the goats and sheep to graze, and they stockpiled for the winter. I was going to film the family and cook them a Moroccan meal ala Jenny, I decided I would cook a nice deboned leg of with yummy ingredients. Instead of going to the butcher in the village to buy a leg of lamb for the shoot, they said that they would slaughter one there own sheep and that we should join them for dinner the night before the filming was to take place. They kept one of the legs from the lamb aside for me to use the next day and they made a feast from ever part of the lamb in my honour that night for dinner. They made kebabs from the liver and lungs, tagine from the shoulders and a delicious roast from the ribs and the other leg, I loved every morsel except the lungs and liver kebabs, not my cup of Darjeeling Darlink! By the way one of the dishes they promised was a lizard tagine, I prayed so hard that they would not find any and I promised god if he kept the lizards unground in their holes I would With a happy heart, I would cook them a fruity lamb tagine instead. Make the flavored butter first. Place all the ingredients into a bowl, mix well and chill. Remove from the fridge 20 minutes before you need it and set aside. Now make the couscous stuffing. Heat the olive oil in a saucepan, and sweat the onion for a minute or two. Add the remaining ingredients, except the couscous and parsley. Season the mixture with salt and pepper and stir over a moderate heat for five minutes, adding a little water if it starts to stick. Remove from the heat and stir in the couscous and parsley. Preheat oven 160 °C. Lay the lamb onto a flat surface and open it up gently with a knife. Spread the flavored butter paste onto both sides of the butterflied lamb. 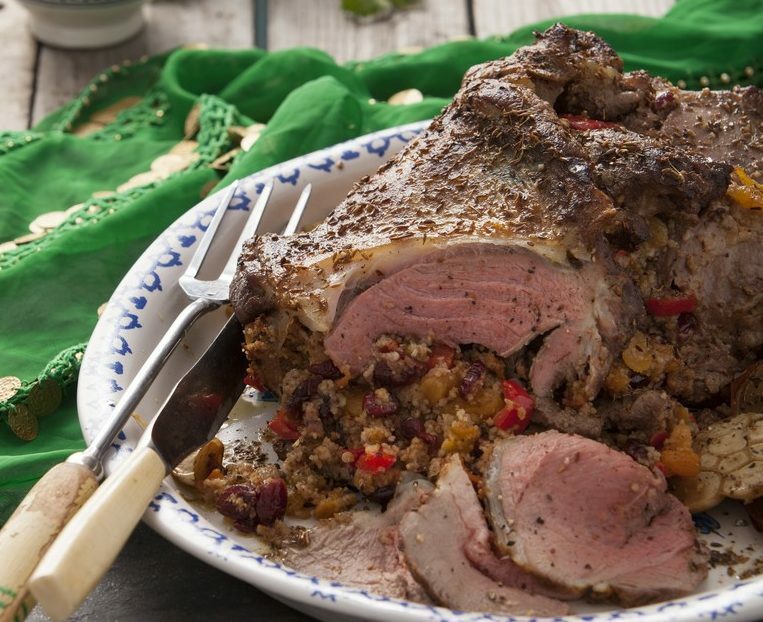 Spread the couscous filling onto the lamb and roll it up tightly, securing with string or toothpicks. Scatter the casserole base ingredients over the bottom of a casserole dish or deep oven tray. Place the stuffed lamb on top and pour over the chicken stock. Cover with foil and roast in the preheated oven for two-and-a-half hours or until cooked. Tip: I like to use a few dried apricots, figs, prunes, dates and cranberries for scattering over the base of the casserole dish.